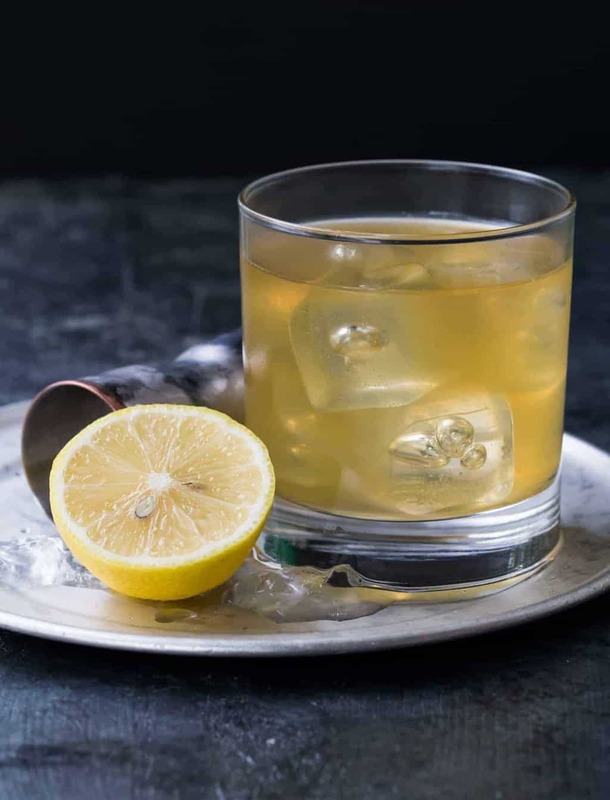 This 3-ingredient Gold Rush Cocktail, made with spicy ginger liqueur, belly-warming bourbon and tart lemon juice, will warm up any chilly fall evening. The cool, cloudy winter months have us pulling out all the stops to add a little spice to our lives, from vibrant sweaters to flavorful munchies to sassy cocktails, including this Gold Rush Cocktail with Bourbon and Ginger Liqueur. Are you a ginger whiskey fan? Even if you just like ginger in your cookies, I’m pretty sure you’re going to love this cocktail. Think of it as a sweet and spicy ginger martini that is made with only three ingredients – perfect for winter snuggling and cozy nights at home. How do you make a ginger martini? A few, well-chosen quality ingredients make all the difference in something being good and something being great. You only need three ingredients for this tasty sipper: smooth bourbon, sweet and spicy ginger liqueur and tart, freshly squeezed lemon juice. Hold the line. Is ginger liqueur the same as ginger ale or ginger beer? Nope, it’s not. Ginger liqueur is a smooth alcoholic cordial with a rich ginger flavor. Ginger ale and most ginger beers are bubbly and non-alcoholic. So you’ve piqued my interest with this ginger liqueur business. What else can I make with ginger liqueur? A few of our favorite cocktails that also use ginger liqueur are these Ginger Pear Martinis, made with pear vodka and ginger liqueur, and these Ginger Grapefruit Prosecco Cocktails, which in my opinion should legally replace all boring mimosa recipes at brunch everywhere. 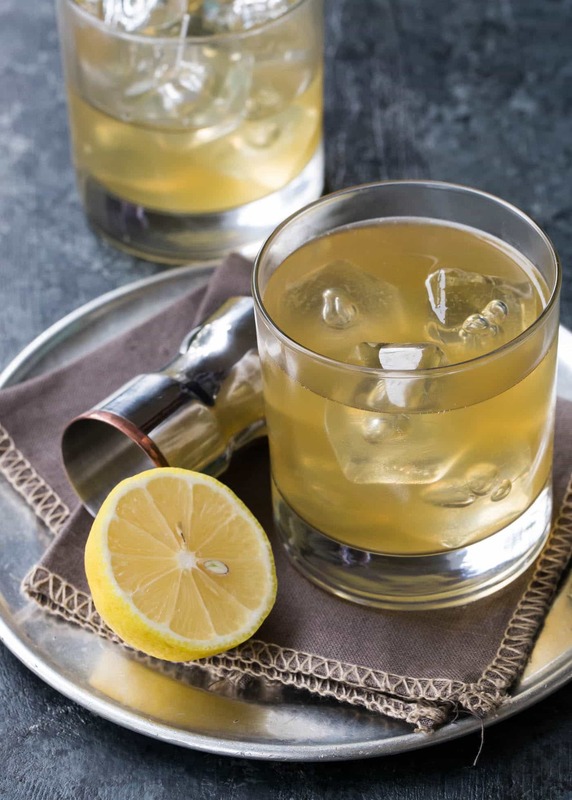 The recipe for these Gold Rush Cocktails with Bourbon and Ginger Liqueur is written for one serving. What if I’m hosting a group? That’s easy; just multiply the recipe by the number of servings you need. The recipe directs you to shake the ingredients in a cocktail shaker but if you’re making the Gold Rush as a batch cocktail, you can skip this step. Simply stir all the ingredients together in a pitcher and pop it in the fridge so it’s well chilled by the time guests arrive. How do I serve this Gold Rush Cocktail? I usually enjoy this drink over ice in a lowball glass, but you can also serve this cocktail straight up in a martini glass and garnish with a strip of lemon peel. The key is to make sure the Gold Rush is well chilled before serving. Whether you enjoy one Gold Rush Cocktail with Bourbon and Ginger Liqueur or mix up a whole pitcher, this spicy sipper adds just the right amount of merry to any occasion. This 3-ingredient Gold Rush Cocktail recipe will warm up any chilly fall evening. Combine all ingredients in a cocktail shaker filled with ice. Shake vigorously until drink is well chilled. Strain into a low ball glass filled with ice. 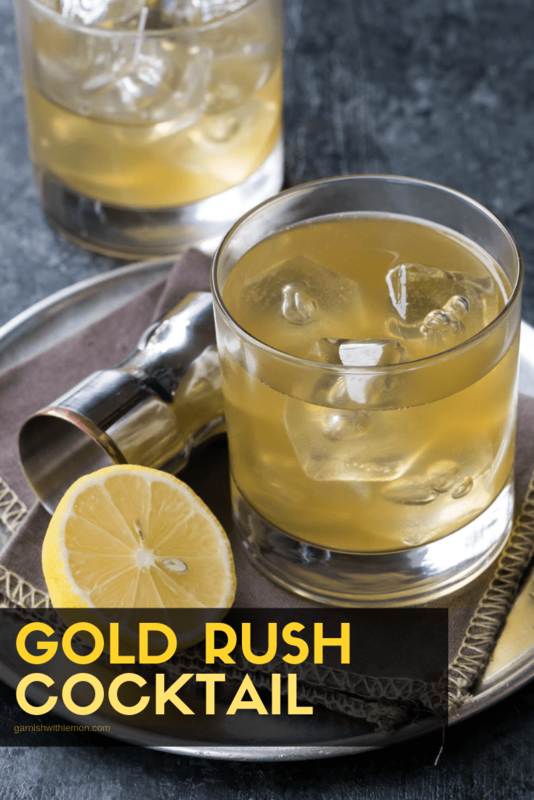 Definitely wish I had one of these gold rush cocktails to devour right now, they look and sound seriously amazing. I hope you try one, Thalia. I love them in the fall! Do you recommend a certain bourbon? Hi Mark, I’m a Bulleit fan, but feel free to use whatever you prefer. Cheers! Delicious! We were playing around with ginger liqueurs, both homemade and commercial, tonight and saw this recipe. We are adding it to our cocktail list for our very picky relatives. This is a keeper. Hi Liz, I’m super impressed that you make your own ginger liqueur! Glad you enjoyed the Gold Rush. It’s perfect for this freezing weather we’re enduring right now. Cheers!